SOUTHERN STATE - Take Southern State Parkway to EXIT 32N (ROUTE 110). 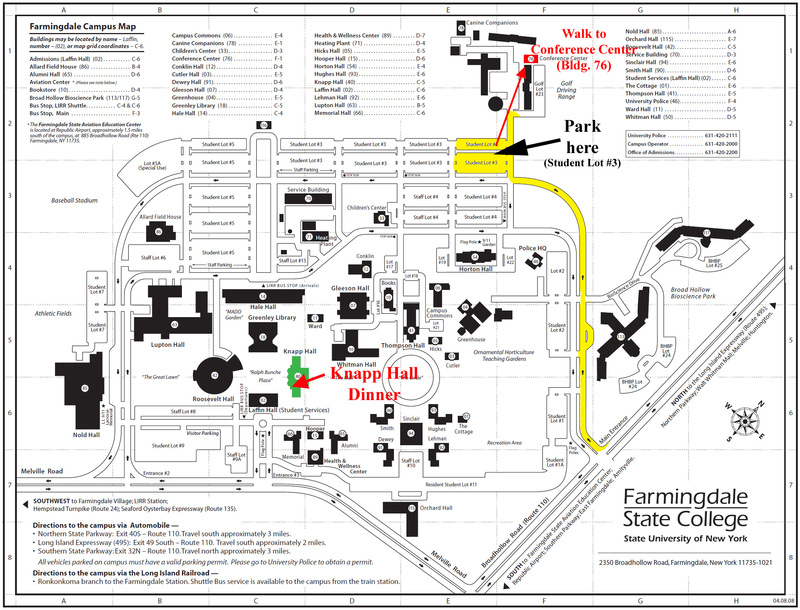 Take Route 110 north 3 miles to Smith Street (second entrance to campus). Make a left onto Smith Street and follow the signs to golf driving range. Park in Student Lot #3 and walk to the Conference Center. SUNRISE HIGHWAY ( ROUTE 27 ) - Take Sunrise Highway to BROADWAY EXIT north (A.k.a. ROUTE 110) in Amityville. Take Route 110 north 6-8 miles to Smith Street. Make a left onto Smith Street and follow the signs to golf driving range. Park in Student Lot #3 and walk to the Conference Center. NORTHERN STATE - Take Northern State Parkway to EXIT 40S (ROUTE 110). Take ROUTE 110 south 3 miles to Smith Street. Make a right onto Smith Street and follow the signs to golf driving range. Park in Student Lot #3 and walk to the Conference Center. LONG ISLAND EXPRESSWAY ( INTERSTATE ROUTE 495 ) - Take the L.I.E. to EXIT 49S (ROUTE 110). Take ROUTE 110 approximately 2 miles to Smith Street. Make a right onto Smith Street and follow the signs to golf driving range. Park in Student Lot #3 and walk to the Conference Center. OUT of STATE & COMMERCIAL PLATE VEHICLES -Take INTERSTATE ROUTE 495 (Long Island Expressway) or ROUTE 27 (Sunrise Highway) once you reach Long Island.